“It is understood that I am purchasing the above property for the purpose of having erected thereon a house which I propose to make my residence, and it is a distinct part of this agreement that I shall not be required to accept a deed to the above property or to pay for said property unless I have the right under the laws of the State of Kentucky and the City of Louisville to occupy said property as a residence.” This offer was accepted by the plaintiff. To the action for specific performance the defendant by way of answer set up the condition above set forth, that he is a colored person, and that on the block of which the lot in controversy is a part there are ten residences, eight of which at the time of the making of the contract were occupied by white people, and only two (those nearest the lot in question) were occupied by colored people, and that under and by virtue of the ordinance of the City of Louisville, approved May 11, 1914, he would not be allowed to occupy the lot as a place of residence. In the court of original jurisdiction in Kentucky, and in the Court of Appeals of that State, the case was made to turn upon the constitutional validity of the ordinance. The Court of Appeals of Kentucky, 165 Kentucky, 559, held the ordinance valid and of itself a complete defense to the action. By the first section of the ordinance it is made unlawful for any colored person to move into and occupy as a residence, place of abode, or to establish and maintain as a place of public assembly any house upon any block upon which a greater number of houses are occupied as residences, places of abode, or places of public assembly by white people than are occupied as residences, places of abode, or places of public assembly by colored people. Section 4 provides that nothing in the ordinance shall affect the location of residences, places of abode or places of assembly made previous to its approval; that nothing contained therein shall be construed so as to prevent the occupancy of residences, places of abode or places of assembly by white or colored servants or employees of occupants of such residences, places of abode or places of public assembly on the block on which they are so employed, and that nothing therein contained shall be construed to prevent any person who, at the date of the passage of the ordinance, shall have acquired or possessed the right to occupy any building as a residence, place of abode or place of assembly from exercising such a right; that nothing contained in the ordinance shall prevent the owner of any building, who when the ordinance became effective, leased, rented, or occupied it as a residence, place of abode or place of public assembly for colored persons, from continuing to rent, lease or occupy such residence, place of abode or place of assembly for such persons, if the owner shall so desire; but if such house should, after the passage of the ordinance, be at any time leased, rented or occupied as a residence, place of abode or place of assembly for white persons, it shall not thereafter be used for colored persons, if such occupation would then be a violation of section one of the ordinance; that nothing contained in the ordinance shall prevent the owner of any building, who when the ordinance became effective leased, rented or occupied it as a residence, place of abode, or place of assembly for white persons from continuing to rent, lease or occupy such residence, place of abode or place of assembly for such purpose, if the owner shall so desire, but if such house should, after the passage of the ordinance, be at any time leased, rented or occupied as a residence, place of abode or place of assembly for colored persons, then it shall not thereafter be used for white persons, if such occupation would then be a violation of section two thereof. The ordinance contains other sections and a violation of its provisions in made an offense. The objection is made that this writ of error should be dismissed because the alleged denial of constitutional rights involves only the rights of colored persons, and the plaintiff in error is a white person. This court has frequently held that while an unconstitutional act is no law, attacks upon the validity of laws can only be entertained when made by those whose rights are directly affected by the law or ordinance in question. Only such persons, it has been settled, can be heard to attack the constitutionality of the law or ordinance. But this case does not run counter to that principle. The property here involved was sold by the plaintiff in error, a white man, on the terms stated, to a colored man; the action for specific performance was entertained in the court below, and in both courts the plaintiff’s right to have the contract enforced was denied solely because of the effect of the ordinance making it illegal for a colored person to occupy the lot sold. But for the ordinance the state courts would have enforced the contract, and the defendant would have been compelled to pay the purchase price and take a conveyance of the premises. The right of the plaintiff in error to sell his property was directly involved and necessarily impaired because it was held in effect that he could not sell the lot to a person of color who was willing and ready to acquire the property, and had obligated himself to take it. This case does not come within the class wherein this court has held that where one seeks to avoid the enforcement of a law or ordinance he must present a grievance of his own, and not rest the attack upon the alleged violation of another’s rights. In this case the property rights of the plaintiff in error are directly and necessarily involved. See Truax v. Raich, 239 U.S. 33, 38. This drastic measure is sought to be justified under the authority of the State in the exercise of the police power. It is said such legislation tends to promote the public peace by preventing racial conflicts; that it tends to maintain racial purity; that it prevents the deterioration of property owned and occupied by white people, which deterioration, it is contended, is sure to follow the occupancy of adjacent premises by persons of color. The authority of the State to pass laws in the exercise of the police power, having for their object the promotion of the public health, safety and welfare is very broad as has been affirmed in numerous and recent decisions of this court. Furthermore, the exercise of this power, embracing nearly all legislation of a local character, is not to be interfered with by the courts where it is within the scope of legislative authority and the means adopted reasonably tend to accomplish a lawful purpose. But it is equally well established that the police power, broad as it is, cannot justify the passage of a law or ordinance which runs counter to the limitations of the Federal Constitution; that principle has been so frequently affirmed in this court that we need not stop to cite the cases. The Federal Constitution and laws passed within its authority are by the express terms of that instrument made the supreme law of the land. The Fourteenth Amendment protects life, liberty, and property from invasion by the States without due process of law. Property is more than the mere thing which a person owns. It is elementary that it includes the right to acquire, use, and dispose of it. The Constitution protects these essential attributes of property. Holden v. Hardy, 169 U.S. 366, 391. Property consists of the free use, enjoyment, and disposal of a person’s acquisitions without control or diminution save by the law of the land. 1 Blackstone’s Commentaries (Cooley’s Ed. ), 127. True it is that dominion over property springing from ownership is not absolute and unqualified. The disposition and use of property may be controlled in the exercise of the police power in the interest of the public health, convenience, or welfare. Harmful occupations may be controlled and regulated. Legitimate business may also be regulated in the interest of the public. Certain uses of property may be confined to portions of the municipality other than the resident district, such as livery stables, brickyards and the like, because of the impairment of the health and comfort of the occupants of neighboring property. Many illustrations might be given from the decisions of this court, and other courts, of this principle, but these cases do not touch the one at bar. The concrete question here is: May the occupancy, and, necessarily, the purchase and sale of property of which occupancy is an incident, be inhibited by the States, or by one of its municipalities, solely because of the color of the proposed occupant of the premises? That one may dispose of his property, subject only to the control of lawful enactments curtailing that right in the public interest, must be conceded. The question now presented makes it pertinent to enquire into the constitutional right of the white man to sell his property to a colored man, having in view the legal status of the purchaser and occupant. Following the Civil War certain amendments to the Federal Constitution were adopted, which have become an integral part of that instrument, equally binding upon all the States and fixing certain fundamental rights which all are bound to respect. The Thirteenth Amendment abolished slavery in the United States and in all places subject to their jurisdiction, and gave Congress power to enforce the Amendment by appropriate legislation. The Fourteenth Amendment made all persons born or naturalized in the United States citizens of the United States and of the States in which they reside, and provided that no State shall make or enforce any law which shall abridge the privileges or immunities of citizens of the United States, and that no State shall deprive any person of life, liberty, or property without due process of law, nor deny to any person the equal protection of the laws. The effect of these Amendments was first dealt with by this court in The Slaughter House Cases, 16 Wall. 36. The reasons for the adoption of the Amendments were elaborately considered by a court familiar with the times in which the necessity for the Amendments arose and with the circumstances which impelled their adoption. In that case Mr. Justice Miller, who spoke for the majority, pointed out that the colored race, having been freed from slavery by the Thirteenth Amendment, was raised to the dignity of citizenship and equality of civil rights by the Fourteenth Amendment, and the States were prohibited from abridging the privileges and immunities of such citizens, or depriving any person of life, liberty, or property without due process of law. While a principal purpose of the latter Amendment was to protect persons of color, the broad language used was deemed sufficient to protect all persons, white or black, against discriminatory legislation by the States. This is now the settled law. In many of the cases since arising the question of color has not been involved and the cases have been decided upon alleged violations of civil or property rights irrespective of the race or color of the complainant. In The Slaughter House Cases it was recognized that the chief inducement to the passage of the Amendment was the desire to extend federal protection to the recently emancipated race from unfriendly and discriminating legislation by the States. “It [the Fourteenth Amendment] was designed to assure to the colored race the enjoyment of all the civil rights that under the law are enjoyed by white persons, and to give to that race the protection of the general government, in that enjoyment, whenever it should be denied by the States. It not only gave citizenship and the privileges of citizenship to persons of color, but it denied to any State the power to withhold from them the equal protection of the laws, and authorized Congress to enforce its provisions by appropriate legislation. . . . It ordains that no State shall make or enforce any laws which shall abridge the privileges or immunities of citizens of the United States. . . . It ordains that no State shall deprive any person of life, liberty, or property, without due process of law, or deny to any person within its jurisdiction the equal protection of the laws. What is this but declaring that the law in the States shall be the same for the black as for the white; that all persons, whether colored or white, shall stand equal before the laws of the States, and, in regard to the colored race, for whose protection the amendment was primarily designed, that no discrimination shall be made against them by law because of their color? . . . The statute of 1866, originally passed under sanction of the Thirteenth Amendment, 14 Stat. 27, and practically reenacted after the adoption of the Fourteenth Amendment, 16 Stat. 144, expressly provided that all citizens of the United States in any State shall have the same right to purchase property as is enjoyed by white citizens. Colored persons are citizens of the United States and have the right to purchase property and enjoy and use the same without laws discriminating against them solely on account of color. Hall v. DeCuir, 95 U.S. 485, 508. These enactments did not deal with the social rights of men, but with those fundamental rights in property which it was intended to secure upon the same terms to citizens of every race and color. Civil Rights Cases, 109 U.S. 3, 22. The Fourteenth Amendment and these statutes enacted in furtherance of its purpose operate to qualify and entitle a colored man to acquire property without state legislation discriminating against him solely because of color. The defendant in error insists that Plessy v. Ferguson, 163 U.S. 537, is controlling in principle in favor of the judgment of the court below. In that case this court held that a provision of a statute of Louisiana requiring railway companies carrying passengers to provide in their coaches equal but separate accommodations for the white and colored races did not run counter to the provisions of the Fourteenth Amendment. It is to be observed that in that case there was no attempt to deprive persons of color of transportation in the coaches of the public carrier, and the express requirements were for equal though separate accommodations for the white and colored races. In Plessy v. Ferguson, classification of accommodation was permitted upon the basis of equality for both races. In the Berea College Case, 211 U.S. 45, a state statute was sustained in the courts of Kentucky, which, while permitting the education of white persons and negroes in different localities by the same incorporated institution, prohibited their attendance at the same place, and in this court the judgment of the Court of Appeals of Kentucky was affirmed solely upon the reserved authority of the legislature of Kentucky to alter, amend, or repeal charters of its own corporations, and the question here involved was neither discussed nor decided. “In each instance the complaining person was afforded the opportunity to ride, or to attend institutions of learning, or afforded the thing of whatever nature to which in the particular case he was entitled. The most that was done was to require him as a member of a class to conform with reasonable rules in regard to the separation of the races. In none of them was he denied the right to use, control, or dispose of his property, as in this case. Property of a person, whether as a member of a class or as an individual, cannot be taken without due process of law. In the recent case of McCabe v. Atchison &c. Ry. Co., 235 U.S. 151, where the court had under consideration a statute which allowed railroad companies to furnish dining-cars for white people and to refuse to furnish dining-cars altogether for colored persons, this language was used in reference to the contentions of the attorney general: ‘This argument with respect to volume of traffic seems to us to be without merit. It makes the constitutional right depend upon the number of persons who may be discriminated against, whereas the essence of the constitutional right is that it is a personal one.’ . . . It is urged that this proposed segregation will promote the public peace by preventing race conflicts. Desirable as this is, and important as is the preservation of the public peace, this aim cannot be accomplished by laws or ordinances which deny rights created or protected by the Federal Constitution. We think this attempt to prevent the alienation of the property in question to a person of color was not a legitimate exercise of the police power of the State, and is in direct violation of the fundamental law enacted in the Fourteenth Amendment of the Constitution preventing state interference with property rights except by due process of law. That being the case the ordinance cannot stand. 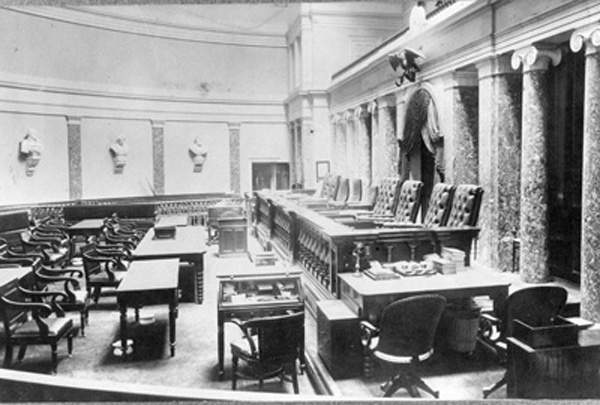 Booth v. Illinois, 184 U.S. 425, 429; Otis v. Parker, 187 U.S. 606, 609.